Tufo have developed special double sided tubular gluing tape for installing on their own tubulars on any tubular rim. This tape is very different from all the similar products on the market. When using the tape, installation of the tubular is fast, safe and very clean. Right after the installation, your wheels are ready for riding, no need to wait for the glue to set. 1. The tape consists of a few layers, every layer has its function with its own specific rim side and tyre side. 2. 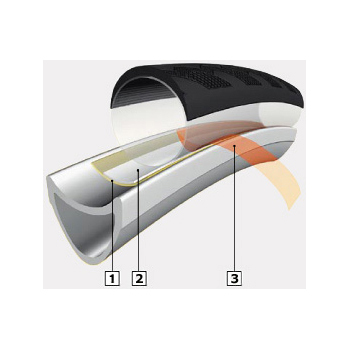 Active white strip on the tyre side is absorbed into the tubular base tape resulting in a perfect tubular rim bond. 3. Due to the protective plastic film, the tubular is easily installed and centred on the rim. The film is pulled out from underneath the tubular after installation. Tufo Tub Tape for Road Wheels is rated 4.7 out of 5 by 175. Rated 4 out of 5 by RichardMM from Questionable value I must admit that I missed the small print that said - 'enough for one tubular'. Previously I've always used Advance Tub tape which comes in quantities that will stick 2 wheels/tubs which means that if you have a problem there's always enough tape to have a second attempt. It does the job and fits the rim nicely but I'll go for Advance next time. How many wheels does this product do? i.e. one or two? yes, you fit a new tape and tyre when changing. this is a very sticky tape, but you roll the tyre off when its deflated, using the palms of your hands. The tape often pulls off in one continuous strip through my own use. TUFO recommend only using this with their tubulars, due to the way they are manufactured. can tufo tape be used on other brands of tubs eg conti and vittoria? I used it on Continental Competitions. No problems until I had to remove the tyre to true the wheel. It left a lot of residue on the tyre which is practically impossible to remove, therefore making the tyre unusable. Is this what used to be called Tufo Extreme tape? Yes, I believe it is. I have been using Tufo Extreme for many years and now use this. The only difference that I can see is that you no longer have the hassle of taking off the backing tape to stick the tape on the rim. So this is much easier to use. When a taped tyre is removed from a tubular rim will the tape stick to the tyre or rim? Or does it just break up? Does the carbon rim need to be cleaned if used with glue before? Will I need to clean my rim completely if using this for the first time? I have used normal glue previously so there is some residue left on my rims. Will this need to be completely removed or will this tape stick to the glue already on the rim? 19mm tape for 23mm wide rims ok? My tubs are 23mm wide, will 19mm wide tape work ok, or do i need the mountain bike version? Can this tape handle high temps? I wonder how it will perform on long descents with lots of braking....anyone out there tried it in the Alps? Tufo suggest that this is suitable for high temperature climates. Can I use this with Continental Sprinter tubular tyres? This will be fine for the tyres you have suggested. You are also able to reapply a tyre more than once provided the tyre is prepared again for application. Is this tape suitable for 2015 Bora wheels? Can I use these with the 2015 Boras which are wider now? these are suitable for 19mm rim use.